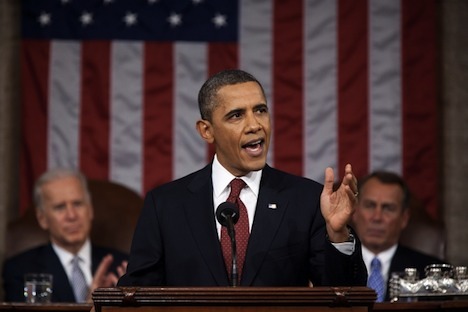 In his 2012 State of the Union address, President Obama stated his case for placing higher taxes on the rich and reining in the excesses of Wall Street that led to the global financial crisis. Obama is continuing the populist theme on a 3 day tour of 5 states. Obama has called for a 30 percent minimum tax on millionaires, which is being referred to as the ‘Buffet Rule’, as billionaire investor Warren Buffett supports such a move. Recently, Buffett has stated that he thinks people in his position should indeed be taxed more. He is one of the wealthiest people in the world. As if to underline the point, tax records of Mitt Romney, a potential Republican campaign opponent, have recently been released. It has been revealed that Romney is one of the richest people to ever have campaigned for the presidency, yet pays less tax than many high wage-earning Americans. In campaigning mode, and perhaps in an acknowledgement and attempted appeasement of the ongoing Occupy protest movement, Obama seems to be framing himself as a champion of the people, and particularly of the middle class. The Obama Administration seems to be attempting to tap into ongoing anger over the practices of Wall Street that led to the boom and massive bust of the housing bubble, and consequent deep recession. He has accused Republicans of wanting to go back to the same old policies that “got us into this mess”, and that have “stacked the deck against middle class Americans for years”. Obama has said he would approach the attorney general to create a specific financial crimes unit to prosecute those charged with breaking the law, and whose fraud led to the global financial crisis. Republicans have accused the president of supporting policies the will kill jobs and hold back U.S. growth. In turn, Obama has accused Republicans of obstructing his administration’s recovery efforts in Congress. Republicans strongly oppose raising taxes for the wealthy, arguing this would impact overall economic growth. Obama has a major campaign challenge ahead, as no president in living memory has ever been reelected with the unemployment rate as high as it is, and with the economy in such a fragile state. Do you think the American people will elect Obama for a second term, given the extraordinary circumstances of the ongoing global financial crisis? Or will there be a change of government?